Townsville, Queensland will play host to a massive Easter weekend, with the 2019 Australian Senior Speedway Sidecar Championships running on Sunday 21st April! If the 2019 Australian Senior Solo Speedway Championship back in January is anything to go by, we’re in for a thrilling weekend filled to the brim with world class racing! Motorcycling Australia (MA) is pleased to announce the release of both the Australian Senior Speedway Sidecar Championship and Australian U16 Speedway Sidecar Championships Supplementary Regulations, and the official opening of nominations for both Championships via Ridernet. Please note that nominations must be submitted prior to Thursday 21st March at 4:45PM (AEDT). No late nominations will be accepted. 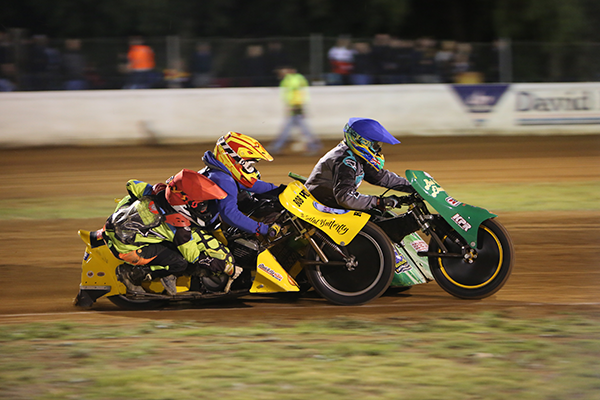 Hosted by the North Queensland Speedway Riders and Supports Club, the 2019 Australian Senior Speedway Sidecar Championship will kick off on Saturday 20th April with a Qualifier from 6:30PM. Of the riders nominated, 16 will be selected by the MA Speedway Commission. Following on from the Qualifier, the Australian Speedway Sidecar Championship will run on Sunday 21st April from 6:30PM. The 2019 Australian U16 Speedway Sidecar Championship will run alongside the seniors on Sunday from 6:30PM! All riders, both senior and under 16’s must note that practice will be run only on Saturday 20th April from 4:30PM, before the Qualifiers for the 2019 Australian Senior Speedway Sidecar Championship. Nominations will only be accepted if completed and received online via Ridernet. All nominations close on Thursday 21st March at 4:45PM (AEDT)! To download the Supplementary Regulations and complete your nomination, please click here and head to the Speedway section. To stay updated on all the action and any news in the lead up to the two Championships, keep an eye on the Australian Speedway Championships website and Facebook, as well as MA’s website, Facebook and Instagram.